This season, The Hockey Writers will have a recurring “Three Takeaways” feature after every Columbus Blue Jackets matchup, meant to serve as post-game quick hits. 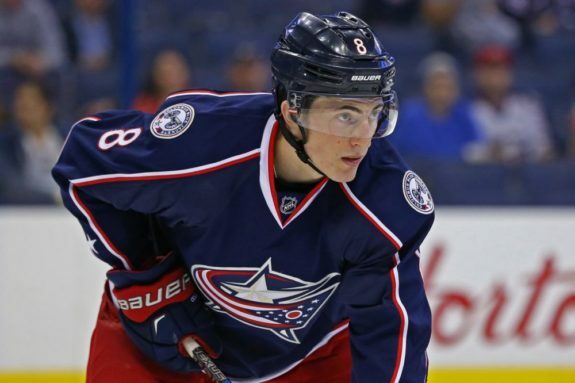 The two forwards quickly found chemistry, connecting on Milano’s first NHL goal against the team he grew up watching in Long Island to open things just 1:07 into the Columbus Blue Jackets’ first game of the season. Milano and Bjorkstrand put on a passing and stick-handling clinic on nearly every shift, using their speed to crash the net and generate scoring chances. It was only their first game partnered on NHL ice together this season, but what they showcased brought back memories of what the two were able to accomplish in their time together with the Blue Jackets’ American Hockey League (AHL) affiliate—a Calder Cup in the 2015-16 season. Milano credited playing with Bjorkstrand previously to their early-season chemistry. Nothing like getting the game started with an #NHLFirst. The Blue Jackets’ power play, which was considered by many to be one of the league’s best coming into this season, was off to a hot start in their first outing. Though it was not official, the Blue Jackets were able to get a lethal six-man unit on the ice in short order and on a delayed penalty call against the Islanders. When they went on the power play “for real,” they generated five shots and defenseman Zach Werenski was rewarded with a power-play goal with one of his signature moves: a one-timer from the blue line. Forward Alexander Wennberg, who played alongside newcomer Artemi Panarin, said it was a relief to find the early success. The entire team hopes the chemistry continues past the first game, too. The Blue Jackets also did a great job cleaning up in front of No. 1 goaltender Sergei Bobrovsky when needed. There were a few bad-angle shots that made it through and bounced off the goaltender, but the team was there to bail out Bobrovsky when he required assistance. They also knew when to steer clear of his line of vision to let him make the big stops. Last season’s Vezina-winning goaltender proved why he cleaned up that award in his first test of the season, going a perfect 29 stops on 29 Islanders shots. Blue Jackets head coach John Tortorella even called out the team’s play “getting back” as the best aspect in his opinion. Either way, it was a positive thing for the Blue Jackets to see their No. 1 goaltender confident right off the bat, and that last season’s trusted relationship between the skaters and netminder is still intact.